Most of us arrived during noon in the capital of Chukotka, Anadyr. Some of us came via Europe and Moscow, others arrived from Nome in Alaska. Some of the Expedition Team welcomed us at the airport. On the way to the baggage hall we had to pass a gallery of photos of the region to get an idea what we might meet during the next couple of days on our adventure. This started as soon as we caught a taxi to the local harbour, caught the car ferry out to our ship ‘Professor Khromov’ and spotted our first wildlife: Larga seals and Glaucous gulls. We “from Nome” got the chance for a little city stroll while the “Europeans” (i.e. via Moscow) went straight to the ship. The city of Anadyr has a population of about ten-thousand whom are mainly employed in the administration, schools and the hospital. High above the harbour rises Russia’s largest operating wooden church, next to which a very modern culture hall has been build. Chukotka’s famous author Jury Rychëu has a monument in his honour in the park in front of these buildings. In the afternoon the wind picked up and those left in town needed several attempts to get a ride to the ship. But finally we got on board and after the first introduction meetings we were very pleased to get a delicious warm meal at dinner time. We enjoyed a late breakfast followed by a couple of meetings to get to know the ship, how to travel safely on board and whilst ashore and hear about plans for the next few days. 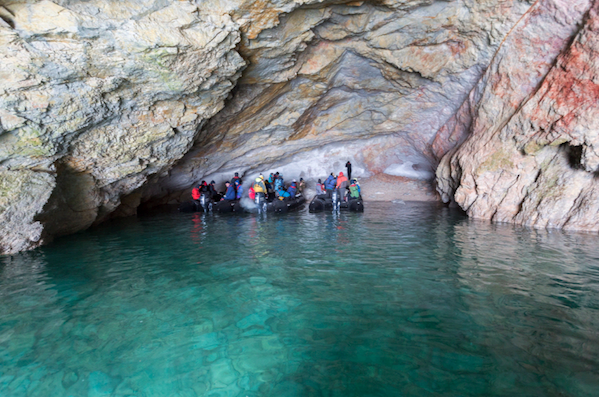 After lunch we started the expedition with a zodiac cruise along a bird cliff. Hundreds of Common guillemots, Brunnich's guillemots, Northern fulmars, Black legged kittiwakes, Horned and Crested puffins were nesting and resting here or flying around very busily and noisily. Most of the species still had juveniles to take care of. The cliffs were spectacular, most of them consisting of igneous rock that does not weather easily. However erosion provided a good number of breeding ledges for the numerous sea birds. Here and there intrusions of later tectonic activities could be seen. After the cruise we got the chance to move our legs a bit. The boats landed on the beach at Preobrazheniya Bay where we could head off for individual strolls in the tundra. Some of us enjoyed the view from the surrounding hills. Others focused more on the vegetation and the bird life. Close to the landing site the remains of some old dwellings were found. Whale bones were scattered across the area. Some cups and a tea pot waited at a fire place to be taken into use again. However, some bear signs close to the landing site reminded us about the presence of Brown bears in the area. Most of us were already out and about before the wake-up call. The ship was anchored in front of Whale-bone Alley beach, which our morning landing site. Pelagic shags and Kittiwakes passed the ship and in the direction of the sun we counted a few whale blows. We started our adventure straight after breakfast. Once ashore we spread out over the tundra to enjoy the place. It is assumed to have been a hunting site, or maybe even a religious place. The Chukchi people call the Island Yttygran or “Dwelling on half way”. Eskimo people call it Sikiklyuk or “meat pit”. When archaeologists discovered the site in the 1970s they found about 120 meat pits, many of them meat pits in the scree slopes. Today huge whale bones are left here at the coast, and a number had been planted upright in the ground. After everybody got to see what they wanted to see, we headed off to look for whales along the coast. Soon a couple of blows were spotted and soon it seemed every zodiac got its own gray whale to view. After yet another delicious lunch we went ashore at the little settlement of Gilmymyl. Here a couple of Chukchi and Eskimo families live during the summer. A wooden pool of warm (about 38°C) natural water close to the river awaited us. Hot springs with a lot of steam ran down to the river. Some of them have been so hot, that even fish have been boiled in it. The scenery was stunning! On the way to and from the place we could pick blueberries or watch wildlife. Ground squirrels were warning here and there and a Red fox was barking and running alongside the river. In the distance sandhill cranes were looking for food in the wetlands. When we left this beautiful coastline in the evening, Humpback whales were breaching in the sunset, as though to say good bye. 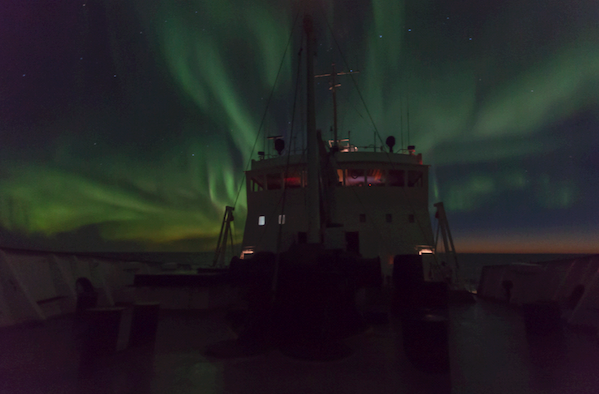 We went to a well deserved night’s sleep until we got woken up again, by the beautiful northern lights. Surely almost everybody tried to get a glimpse of it before heading to bed a second time. The weather looked promising this morning at this, the most easterly point on the Eurasian continent. The ship was anchored in the lee, so we could climb in our inflatables for a bumpy ride to the historical settlement of Naukan. We stepped ashore on a gravelly beach. The surrounding landscape was overwhelming. White-capped waves were breaking on shore. A light fog of saltwater spray was laying over the beach. A huge piece of Bowhead-whale baleen was washed ashore and captured our interest. It was not easy to climb the slopes, to reach the former Eskimo village of Naukan. The ground was undermined by voles and ground squirrels and a tight carpet of wormwood covered the scene. Katya told us that the settlement consisted of the ruins of 62 yarangas. About 400 people used to live here. Below the foundations smaller ruins of probably stores were situated, along with erected whale bones that had been used to store and dry the skin boats (baidara) of the local hunters. The settlement was discovered in 1930 and a Russian border guard post was built nearby during the Cold War, now just old, weathered houses collapsing into the sea and a light house on the east side of the beach. Unfortunately the settlement of Naukan was forcibly relocated by the Soviet government in 1958 during the process of centralisation and now lies abandoned. When we returned to the ship we saw groups of walrus swimming below the steep cliffs of the Cape. This morning could not have been better! The afternoon we spent on board, since we had to cover some distance to our next destination. The on-board program included an interesting lecture on Alcids (puffins, guillemots et al.) by Samuel. Later Katya presented a very informative introduction about the hard life and the sad history of the peoples of Chukotka. This morning we anchored close to the southern spit of Kolyuchin Island, where the ship was sheltered from the strong cold wind. However there was little shelter on the top of the island when we went onshore for some bird watching. 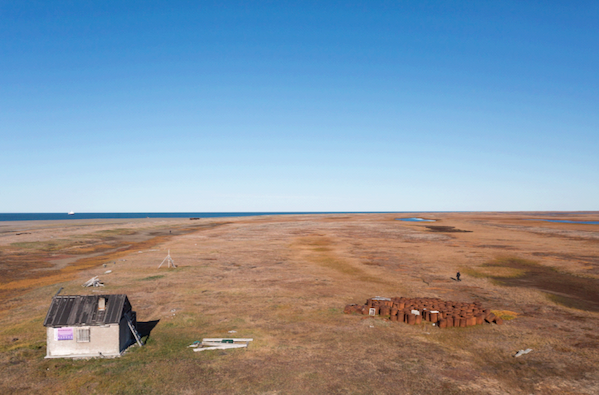 Our landing site was situated below abandoned buildings; the smaller ones built during the 1950s when Russia opened its Northern Sea route for ship traffic. Icebreaker caravans were in need of weather data, and the Kolyuchin Station was one of many along the northern coastline (first based on the mainland, later moved to this island). The larger buildings were added about a decade later. The island consists of metamorphic rock, with beautiful boulders of gneiss scattered along the beach and sections of the top of the island. The weathered cliffs provide perfect breeding ledges for puffins, guillemots, shags and gulls. Most of us found good spots to sit while observing the bird life. It was spectacular to see all these species in one place, interacting with each other. Pelagic shags shared resting sites with common guillemots. Horned and tufted puffins sat side by side. The wind helped us get pictures of flying birds, since most of them glided gently on the back of the wind. Although the cold was felt in the wind, most of us were still ready for the next adventure. We took the Zodiacs to the northern corner of the island where a few small huts were situated. Some were used by local hunters, another is home for a ranger/scientist studying walrus during the summer months. As we got to hear, the ranger shares the island with a young female polar bear that comes each afternoon to dine on a walrus carcass on the sandy spit close by. She also feeds on a young grey whale carcass we saw washed up against the rocks. We did not see the bear, but further round on the exposed side of the island saw hundreds of walrus hauled out on the rocks. A larger group played with us in the choppy water – sometimes did they disappeared behind a wave, sometimes we did. After lunch we spent the rest of the day at sea; more time for rest and education. Agnes offered us a virtual voyage into the world of ice: from ‘grease’ and ‘pancake’ ice, to brine and icicles, to the dependence of seals, bears and birds on the sea ice. Afterwards we the on-board shop opened briefly. Many bought woolen sweaters to be prepared for the next destination, Wrangel Island in autumn. Katya talked about Wrangel Island and its unique nature and history. Chukchi and Eskimo people (who lived on the island thousands of years ago) knew of the existence of the island long before Europeans ‘discovered’ it and first set foot on it in 1881. Since 1926 people have lived there the whole year around. For that purpose some Eskimo families left their home on the mainland to live at Wrangel permanently. Later came scientists and a doctor. The island is also home to large terrestrial mammals including Polar bear, wolverine, wolf, reindeer and musk ox (reintroduced). Two species of lemming provide food for Snowy owls and Arctic foxes, with many terrestrial bird species spending the summer in the rich tundra to breed. 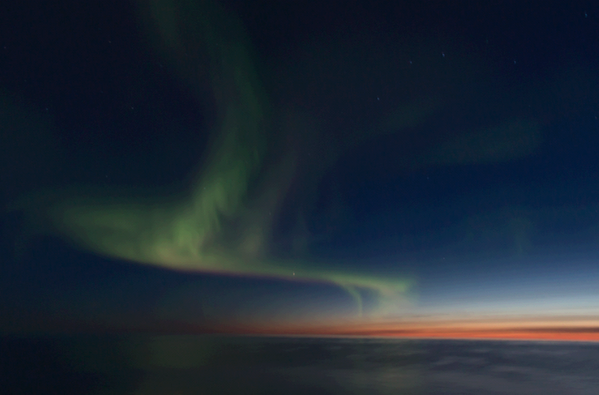 The night finished with a spectacular Aurora Borealis. Curtains of green, yellow and red light moved across the sky until a light green light bow was left alone on the firmament. Many of us were on the sunny outside decks well before the wake up call today. Already from a long distance we could see the object of our voyage: Wrangel Island. 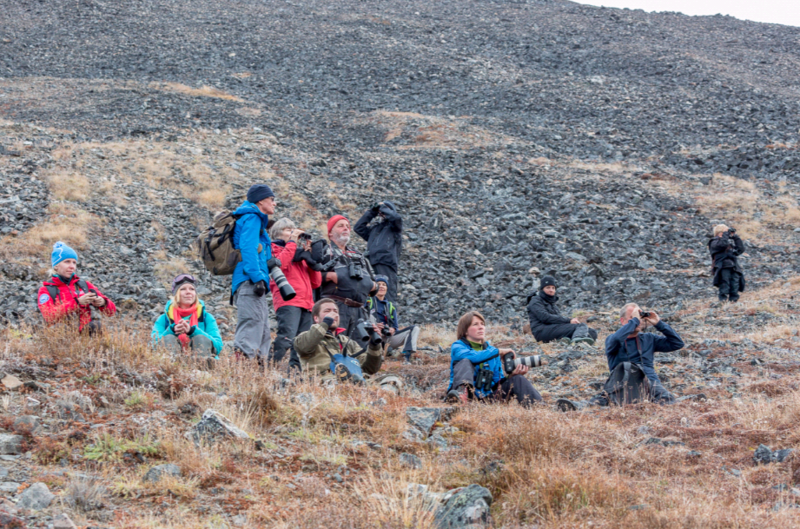 When we got closer some of us spotted the first white-yellow (polar bears) and black dots (musk ox). But before we went ashore, we had a compulsory polar bear safety briefing while Rodney picked up some local rangers from the station. 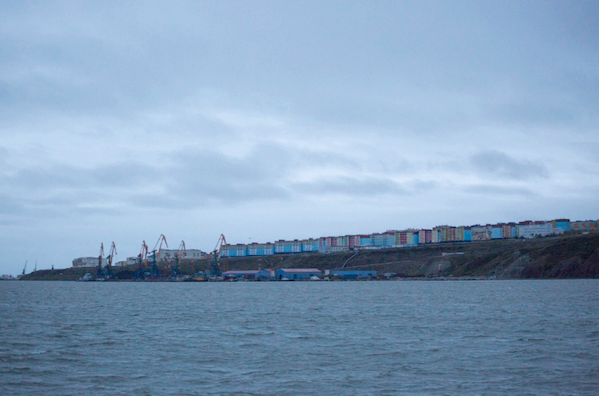 About ten o’clock we set out for our first excursion on Wrangel. Firstly we visited four Polar bears that waited for us ashore. Three big and well-fed males had a sunbath above the coastline. A fourth bear, a young male, was bit more cautious and did not come down to the shore. However we got a good glimpse of all members of this welcome committee. Then it was time to stretch the legs. A larger group of hikers went across the hills. They met a nice group of muskoxen in the tundra and yet another bear in the distance. The others aimed for an old Palaeo-eskimo spot, one group via the tundra and the other by zodiac. Apparently people lived here about 2800 years B.P, a time when mammoths still grazed the Arctic plains. Lunch was delayed, but easy and tasty as always. We hardly had time to catch our breath before we went out again, this time to the rangers’ station. It was situated within the old ruins of the former village of Doubtful. Here some of us started another adventure for the next two days: crossing the island by tundra-buggy and four-wheel drive. But firstly all of us explored the village and the surrounding tundra. A number of Snowy owls were sitting scattered in the landscape. Snow buntings and plovers were flying between the old buildings. The tundra was dry and almost all vegetation was perished. Soon fog came creeping across the land: Time to return to the warm and hospitable ship and some delicious dinner. Yet another sunny day! Soon after breakfast we entered our Zodiacs to get closer to some bears that had been spotted before. 1,2,3,4,5 … We could find more and more yellow dots. At the end it turned out: every single dot was a Polar bear! Some of them we could observe a bit closer with help of our binoculars or the zoom of our camera. The guides determined all the visible ones as male bears. Interesting how close they can stay together. A fat-belly-male met another bear and both just passed the best regards to each other. Others did not move from their sleeping places high up in the slopes. Number 8 strolled along the tundra to meet up at the gathering. Since none of the bears decided to check us out, we moved on in the direction of Cape Blossom. A long lagoon prevented us from longer walks along the plain, but at least we could stretch our legs. Later we visited the bird cliff at “Ptichy Bazar”. Most of the birds had gone, but a few Brünnich's guillemots, Pelagic shags and dozens of Kittiwakes remained on the ledges. What an impressive mountain! At the very end Rodney spotted a Polar bear in a tidal cave. He was resting there and tried to dig every now and then in the gravel. We tried to sneak towards him with great care and watched him closely. Soon we spotted two more male bears. Although we carefully approached their resting site, they escaped into the water, where we left them alone. On the way from the morning to the afternoon landing, we had counted about 50 bears. After the zodiac cruise we went ashore for some hikes. The short walkers strolled along the beach. They found some wolf, fox and wolverine tracks. Many Grey phalaropes were close to the shore, and they were a beautiful object to observe for birders, photographers, or just nature lovers. 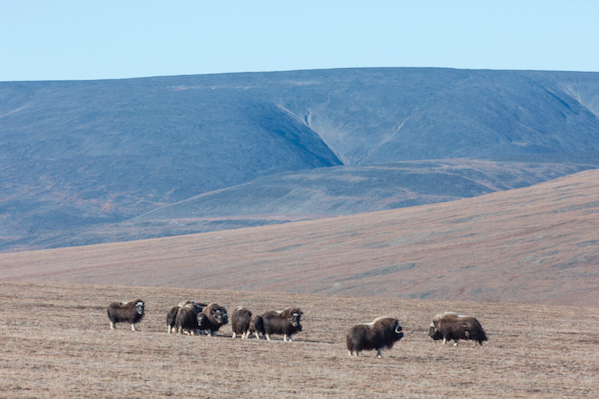 The long hikers went up the bed of Doubtful River to the tundra slopes where a group of about 15-20 muskoxen rested on a terrace. They were mainly female with yearling calves. The calm weather helped us to get quite close to them, without disturbing the animals. The way back led through frost-patterned ground: Freezing groundwater had lifted the tundra here and there, forming small heaps of soil with low, scattered vegetation. The day was long, but not long enough. As soon as we came on board dinner was served and we could recall the day in the restaurant. After the glorious Northern lights we had last night, most of us were still tired when we went for breakfast. Nevertheless, Wrangel waited for us with new adventures. We landed at a place called “Dream Head” (originally ‘Drum Head’, then ‘Drem Khed’, now Dream Head). This area is a traditional and important denning area for Polar bears. There used to be about 12 dens per square kilometre. When we went ashore we spotted some bears in the far distance. We split up in groups. Some of us went on a zodiac cruise and got the chance to sight a bear that presented himself nicely on shore. Others went for a short hike to explore the local features of permafrost activity and watch the bears at the slopes in a distance. One sleeping bear turned out to be a mother with two cubs, that after waking up slowly moved along a ridge at the horizon. The long hikers started to gain some height on a nearby ridge. Yet another nice work-out. On the way they spotted an Arctic fox. They also found remains of a Polar bear den. Lots of tracks marked the area. Nevertheless, the group did not get far before others spotted a female bear that was moving in their direction. Distance updates were passed via VHF-radio. After a great sighting, the bear simply altered course slightly and moved away to disappear in the tundra. What a privilege to have been taking part in this peaceful encounter! Back on board the change-over of the “overlanders” was organised. A quick lunch for the new members and a late one for the incomers. The anchor was lifted and we continued our course along the north coast of Wrangel Island. We reached the northernmost position we reached on this voyage (71°39'N, 179°43'W) above Nakhodna Island. However we were surrounded by dense fog, so there was no way to visit this very low-lying island. Instead we got the chance to learn more about the area, when Chris lectured about the tragic expedition of Captain Bartlett, who navigated his ship Karluk in 1914 through the Bering Strait in dense ice. The ship was wrecked NE of Wrangel Island, and various small groups tried to reach either Wrangel or Herald Island. 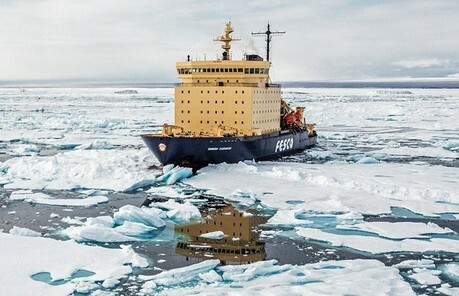 They went back and forth between their food depots on the ice and Wrangel Island, finding their way back in the ice despite heavy ice pressure and ice movement. Captain Bartlett and an Inuit named Kataktovik set off to reach the Chukotka coast and organise a rescue for the others. They crossed the ice and followed the coastline down to the NE corner of Anadyr Bay, where they finally found transport to Alaska. Not until September did two ships arrive at Wrangel (with Bartlett) to carry the survivors home. The summary of this adventure was the loss of 11 lives and a ship. Yesterday we learned about history, today we went to the place, where Bartlett and his men raised their camp for the first time. It has been snowing during the night. The entire landscape was wrapped into a thin layer of snow. We dressed as much as we could and boarded the Zodiacs. At landing site a young bear was resting. When we came closer, she moved up to the ridge to gain some distance. That allowed us to shortly step ashore at the monument that just recently was raised in memory of the Karluk expedition. The beach consisted of loose gravel and the tundra was even more barren as we had seen so far. After a while the bear returned and we returned to the zodiacs for a cruise along the limestone cliffs to the north and south of the bay. Waves and ice had been working hard on the cliffs and carved caves of various size and shape out of the exposed rock. These caves with their small holes and cracks are a perfect breeding site for black guillemots. But most of them had already abandoned the nesting site. Therefore only a few of these birds could be spotted. In the meanwhile we returned to the other side of the bay. There the bear had returned to the beach and waited for us. She posed nicely before she decided to run up a gully and disappeared a third time. We continued the cruise alongside some impressive cliffs before returning to the ship. Before lunch we had to pass a field of scattered pack ice on the way to Herald Island. It was not only beautiful to look at it was also inhabited by yet another bear. The captain circumnavigated the ice field to allow us a better view. How lucky we've been, to find a bear in his natural marine environment! Early afternoon we reached Herald Island. This is a small Island NE of Wrangel Island that was discovered already in 1949, 20 years before Wrangel was known to the Europeans. Captain Henry Kellet on his ship “H.M.S. Herald” was one of the many people in search for the Franklin Expedition. He landed on the island in August 1849. As soon as we went into the Zodiacs the sky got cleared up and we got a great view on the steep cliffs. The Island had clearly been heavily lifted by tectonic forces. Layers of gneiss changed with other colorful metamorphic rock. Their weathering created natural nesting habitats for puffins, guillemots and shags. 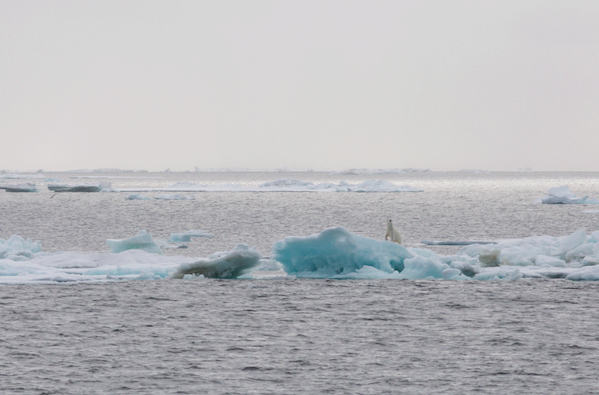 In the southeastern bays we spotted a good number of Polar bears in the distance. Some of them were resting close to the beach, others high up in the slopes. Beyond them were many families. As we came closer many of the resting bears turned out to be two or three. Similar to Wrangel Island, Herald Island is an important denning area for Polar bears. As we moved along the rugged cliffs in nice evening light, we passed some impressive pack ice. There waited more further Southeast, but not for us. We focused still on bears, maybe there will be some, which we could get closer. Just around the corner, Katya spotted a scree slope and pointed out 9 bears. At a closer look a female with three pups, another bear with one pup, some single individuals and a very well fed male had found a resting spot within the size of a soccer field. Just the different boulders divided them from each other and provided shelter. What an encounter! It was amazing to see how easy the bears moved though this field of rocks. The yearlings of the families tried to hide either between the legs of the mother or behind some boulders. From there they glimpsed down to us. After a while we left the bears alone. Returning to the previous bay, we found a spot not inhabited by bears and shortly stepped ashore stretch legs and warm up. Nevertheless, time was over and all of us went back to the warm ship. After yet another delightful breakfast Sasha, our ranger and concurrently the chief inspector of the nature reserve, was giving a talk about their work on Wrangel Island. A nature reserve is the highest protection standard for nature in Russia. All animals, plants and their habitats are protected by law and the inspectors are the highest authority to take care of this. At present they try to clean up the reserve from garbage. They also support scientific projects and groups, maintaining the numerous field huts on the island and monitor wildlife and freshwater habitats. After a short landing information by Chris we went out to Vynjni creek, a huge plain just West of Doubtful village. Three muskoxen were spotted and we got a first good glimpse all together right on the beach. Later we split up in groups. Some were staying in the tundra to recall all the experiences of the last days on this remote Arctic island. Another group went off, to see yet another time the muskoxen, that had moved further into the tundra. While we were ashore, the “overlanders” returned back on board. Soon we joined as well. During lunch we hived anchor and set course Southeast, back to the coast of Chukotka. The sea was very calm and whale blows could be seen here and there on the track. The expedition team offered a lecture program about Polar bears in the afternoon. Samuel gave an overview on the biology of polar bears. These bears are very well adapted to their high arctic habitat. The fur is such that even a thermal camera would not be able to record a bear in the snow. They are great swimmers, being able to cover several hundred kilometers if needed. The sense of smell is extremely well developed, so that the bear must be able to smell a seal carcass across 10-15 km! Later Katya continued on the bear topic. She pointed out that global warming is not necessarily the major threat to bears, since they are evolutionary very flexible animals. Polar bears have most likely existed throughout the last 600,000 years and thus survived several interglacial periods without any problem. The increased presence of human activities in the warming Arctic create conflicts between humans and bears but also natural Polar bear habitats are getting lost. Just on Wrangel the number of denning females have decreased fourfold since the 1990s. The denning females on Wrangel and Herald Island originate both from the coast of Chukotka but also from Alaska. Nowadays more bears are found on land in summer - a sign of deteriorating sea ice habitat. Polar bear hosting countries and wildlife protecting NGOs are not able to find a population sustainable agreement on Polar bear hunt. In a changing climate world, where the bear population is struggling already in its natural habitat, every hunted bear is one dead bear too much. After more beautiful Northern lights during the night we woke up to yet another sunny and calm morning. Already before breakfast whales could be seen in the distance. It was obvious that we were on the way further South, since it was possible to stay on the outside decks without getting too cold. Also later in the morning whales were spotted. 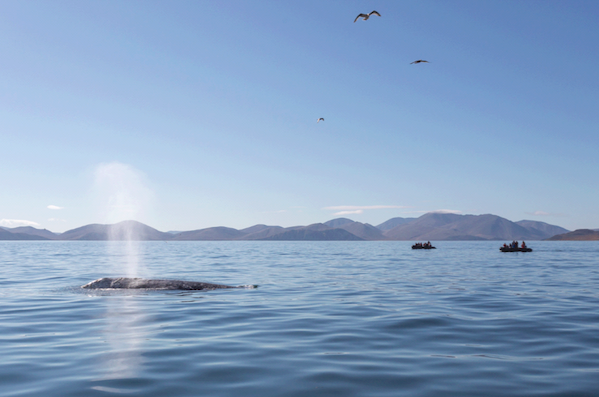 Closer to Kolyuchin Island we had close encounters with Bowhead and Humpback whales. More whale blows were spotted in the distance. Later the on-board education program continued with a documentary on Polar bears on Wrangel Island, by Katyas father Nikita Ovsyanikov: “Life on the Field of Bones”. In the afternoon we landed at Beljaka Spit, a low Peninsula partly closing of the Kolyuchin Inlet towards the Chukchi Sea. The spit was named after the stoker of the survey vessel Vaigatch, who died during the expedition. Between 1911 and 1915 the ship came several times to this area. It was the same expedition that claimed 1911 Wrangel Island for Russia. We strolled freely across the tundra. We found many fresh bear tracks close to the beach. Later the bears were spotted walking away from us along the coastline. 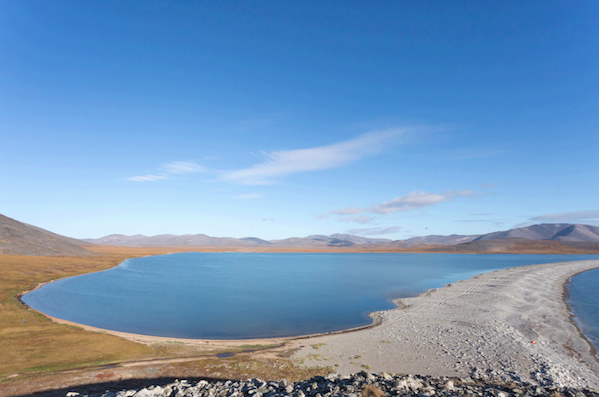 The spit contains a dry tundra wit a lot of small lakes. They were home to various divers and waders. Along the raised beaches we found numerous remains of dwellings. Here and there whalebones were still sticking out the ground. Now the basements were inhabited by ground squirrels and lemmings. Interesting landscape it was indeed. Sand dunes piled up closer to the beach, dry lichen Tundra was situated between wetlands and swampy moss beds. The low sun dressed the scenery in a golden light, perfect for the photographs we wanted to take. After the landing we sailed further into the inlet. 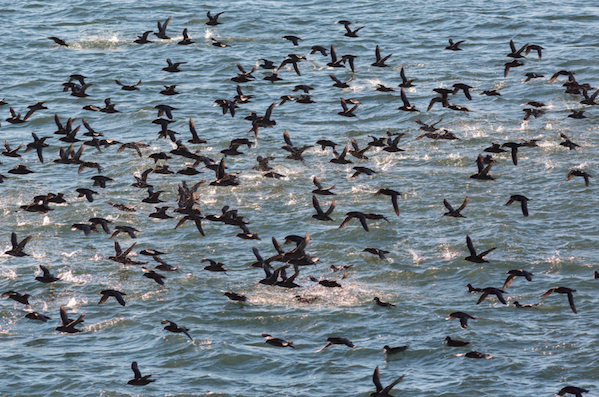 Thousands of Short-tailed shear waters were resting or feeding on the water surface. They took off in big flocks, when the ship steamed along. What weather! How lucky we were on this voyage. Yet another day of sunshine. We still sailed along the northern coastline of Chukotka. We passed by the village of Intchoun and just off Uëlen we met a large pod of Gray whales. The Captain slowed down and we circled between the feeding whales. There were blows everywhere. We could take photos with whale and coastline in the background; with whale and Ratmanova Island in the background; with whale against the sun or with whale with the sun. Some whales we passed by, others showed their tails in the distance. It was glorious! At the end many of us were not even able to take photographs anymore, but just enjoyed this symphony of nature. Later on Samuel gave a talk about the voyages of Vitus Bering. This man spent 15 years of his life on expeditions to explore the Russian Far East. He and his men went 1300 km in 21 months, from St. Petersburg to the village of Okhotsk. They built a vessel that was able to sail in those cold seas, within three months. On their way back the discovered Ratmanova Island or Big Diomedes Island. The second voyage was the “Great Northern Expedition”. It took them five years to move with their equipment the same route and 600 men to carry it. With the ships “St. Peter” and “St. Paul” he and his second captain Cherykov they crossed the North Pacific and discovered independently the Alaskan coast. While “St. Paul” returned, “St. Peter” got shipwrecked at Bering Island, and the commander died there too. This expedition was most likely the most expensive one in the whole history of exploration, and an expedition with most people involved. Soon we arrived at Ratmanova Island. During approach the Little Diomedes Island was visible, and shortly after so was the American settlement there. Straight after lunch we were allowed by the Russian boarder guards to launch our Zodiacs. The sea was calm and it was still warm and sunny, so we were a happy group of explorers to take out to the western cliff, where also the military base was situated. We were allowed to operate here, as long as we would be well behaving: this meant no photos of the base, no pointing or glimpsing to the guards and we would definitely not try to step ashore. 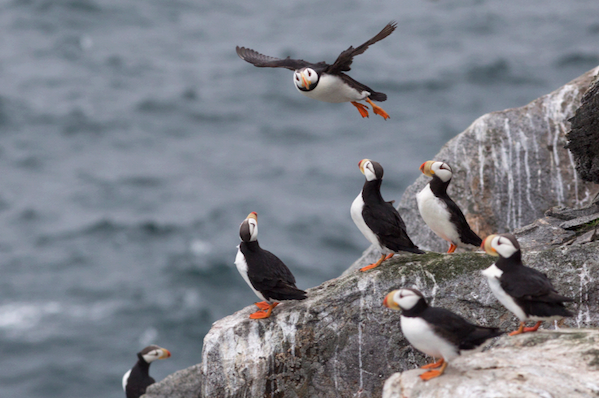 Hundreds of Horned and Tufted puffins and numerous kittiwakes were sitting in the cliffs. As at Herald the rock consisted of weathered and tilted gneisses that provided perfect ledges for breeding birds. Glimpsing secretly, we could see armed guards on the top of the hill watching us. 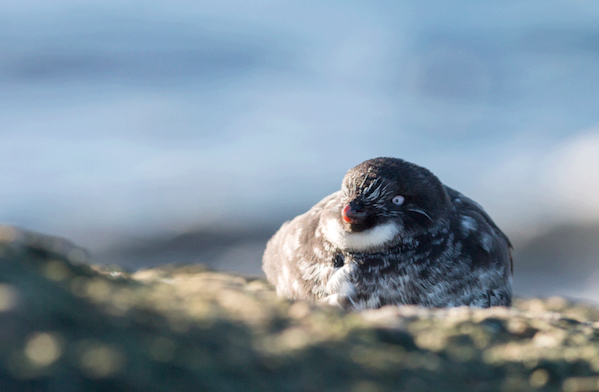 What might they have been thinking, as all of us were gathered underneath the cliff of the base, observing a Least Auklet sun bathing? During afternoon we finally got to learn about walrus. Agnes' lecture had been interrupted and postponed several time because of great wildlife sightings. It does not need teeth to feed, but has a mouth that functions as suction pump. Clams and limpets are collected from the sea bottom and 60-80 kg of their flesh ends up daily in a walrus stomach. Single individuals are apparently also specialising on seabirds or small seals. 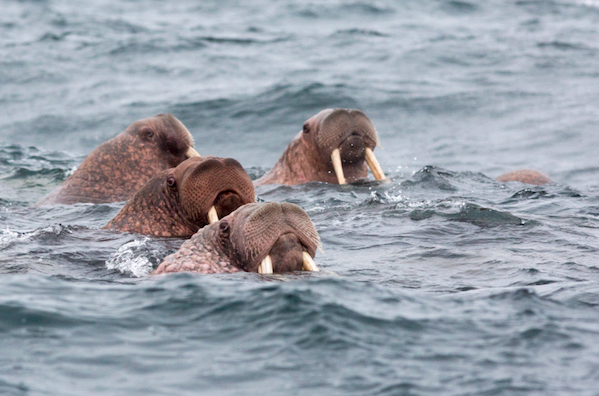 In walrus all individuals have a beard. They use these extreme sensitive whiskers to localize their prey. Mature males have rather thicker tusks and a skin full of bulges, a secondary sexual characteristic. As elegant they are in the sea, they are clumsy ashore, although they have to come ashore to moult. Their new born babies weigh as much as a normally grown human and get fatter by mums high-fat milk. What an interesting animal. Lavrentiya (in Chukchi “Ķytryn”, in Eskimo “Ķyshy”) awaited us in the best summer weather. Soon after breakfast we went ashore and were met by two border guards. Rodney and Katya led us to the central square. A lot of locals were already shyly waiting for us to approach. Loud music was played at the public square. A Yaranga, a traditional Chukchi nomad tent, was standing close to the culture house and boards were erected to show and offer local food and handicrafts. Close by people kept a camp fire for us, to brew their traditional tea. We were offered pickled Mountain sorrel with cooked meat of Grey whale, bread and jam of Arctic blue-berry. One woman even cut thin slices of whale “mantak” with a traditional women's knife and served it either raw with onions or boiled. Some of us went to the little museum. Elisabeth, an Eskimo woman from Naukan (the abandoned settlement of Cape Deshnev), guided us through the exhibition. We learned about the way of living of the two local cultures, their clothing and tools. They were experts in fabricate thin waterproof clothing out of walrus skin and guts. We saw blubber stoves of wood and sledges out of wood and bearded seal skin straps. Shoes and clothes wore a beautiful embroidery of glass pearls, reindeer hair or coloured tiny pieces of skin. Before we could listen to a traditional concert we all had to play Chukchi volleyball. It was a hard match between us. Local children did not just watch as the adults did, but joined the game at the end. Many locals came dressed in their traditional clothing, ready to perform a concert just for us. The men were dressed in black trousers and white anoraks. Most of them carried a drum made of willow and extremely thin walrus gut. The handle was either from reindeer antler or bone. They got a pretty loud sound going when playing all together. 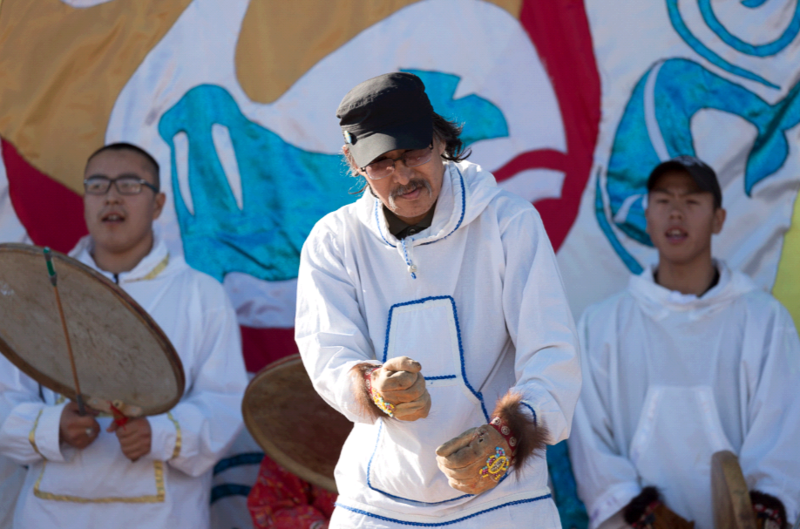 Both men and women had their dances, displaying scenes of the everyday life: reindeer herding, kayaking, sea gull flying, walrus on the beach, bird egg collecting or polar bear hunt. While women were barely moving on the spot men had a more sporty performance. Apparently this type of dance mirrors the little space inside a yaranga, where people barely can move. Back on board, we set course South. Again we spotted numerous Gray whales. Later the lecturing program continued. Samuel told us the story of the German Naturalist Steller, who finally went on the 2nd voyage with Bering to Alaska. As an all-rounder naturalist he came as doctor to the court of Katarina the Great. Here he got the personal doctor of the pope Theophano Prokopovitch who also was the founder of the astronomical department of the Russian Academy of Science. With his royal connections he got on the way to the Far East and studied both plants and wildlife. With two assistants he surveyed the area around Baikal lake, reached Okhotsk and got a lift by the Bering expedition to Kamchatka. Here they explored almost all creeks and learned from and about the native Itelmens and Koryak people. Steller described the area so well, the even todays knowledge bout the wildlife and the landscape of the region derived from his time. Katrin and the two chefs rounded this evening up with mulled wine on the fore deck during sunset. A last day at sea. The Bering Strait was like a mirror. Here and there a whale blow could be seen. This morning Rodney gave us an overview on the logistics such a voyage in the Russian Far East requires. Later on some of us joined for the last time the onboard educational program. Aglaya used the chance to present her knowledge bout adaptation of wildlife to the cold. Elke continued on plant adaptations and climate zones of the Arctic. We learned about permafrost and ice wedges. We got an overview on how the soil is moved by the ice and thus leaves characteristic patterns on the tundra, such as stone runs and polygons. The whole landscape wears marks of the icy ground, with or without vegetation cover. 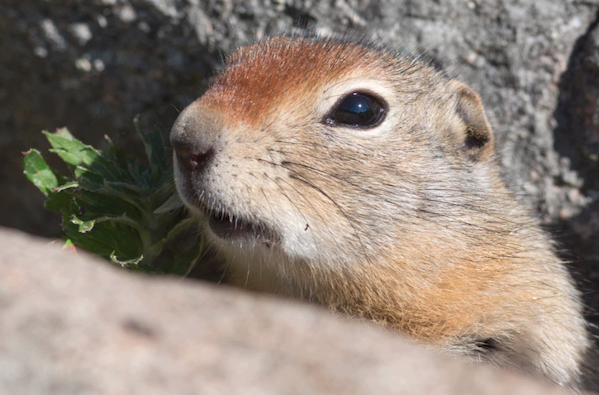 Lemmings, Ground squirrels and Arctic foxes are using these natural structures for both nesting and shelter. Soon packing was on the to-do-list of the afternoon. Only seven of us had planned beforehand to stay for yet another voyage. Rodney explained the disembarkation procedure for the upcoming morning before he handed over to Katya. She had prepared a slide show to just recall all the great adventures of this wonderful voyage. Than there was time for a last sit together in the bar and restaurant followed by yet another great dinner. Heritage Expeditions staff and the crew of “M/V Spirit of Enderby” / “Professor Khromov” thank you for sharing this voyage with us. We hope to see you onboard again one day!
" A big Thank You to Rodney and staff and crew for a fantastic trip to Wrangel and North Eastern Siberia. Amazing wildlife and fascinating culture in an area that get very few visitors. Everything was run very professionally by Rodney and his staff and crew. Already looking forward to my next trip with Heritage... "
" Thank you very much for a wonderful experience. "